Tea Collection has NEW Arrivals! You are here: Home / online shopping / Tea Collection has NEW Arrivals! Just in time for back to school shopping, Tea Collection has new arrivals! These new styles are inspired by Germany’s early 20th century school of Bauhaus, which became famous for its radical union of art and design, and transformed everything from architecture to music. These latest creations feature bold primary colors and modern geometric shapes. 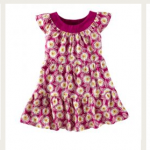 It’s fairy tale romance meets art nouveau and is the perfect combination for little ones ready for fun and adventure!! Another reason I love Tea Collection is because they are committed to giving back! They have exclusive events throughout the year where proceeds are donated to The Global Fund for Children. They support local communities, too! You can sign up to have your school receive 15% of merchandise purchased during their School Days promotion! Tea Collection understands that families are on budgets, too, and they want to help you save! When you sign up for their e-mails, you’ll get 10% off your first order! Just click on the banner above to get your discount! You’ll get the heads up on other store promotions, too! Make sure you check out the “sale” section on their site for all of the best deals! Tea Collection New Arrivals plus 10% off! 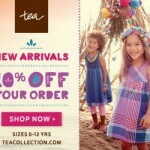 Tea Collection: great deals on clothing for your kids! Tea Collection 25% off sale! 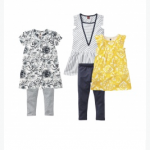 Shop New Madras Coast Arrivals at Tea Collection! Tea Collection’s Summer Styles are HERE! Tea Collection 40% off sale ends today!